I don’t know any child – or parent – that doesn’t love Baloo the Bear. I created this Bear Necessities print because I still love the Jungle Book even though I am all grown up. 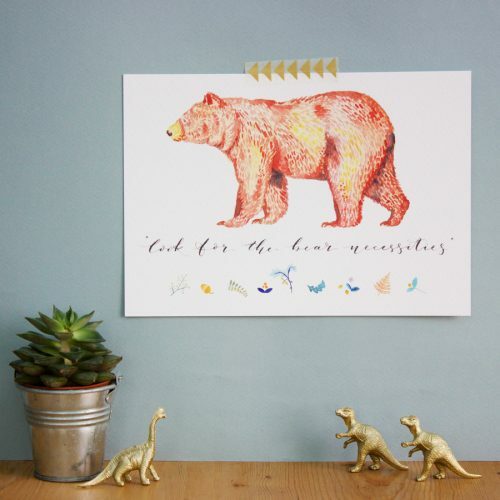 The bear and the plants are all painted in watercolour on this nursery artwork. I really enjoyed creating a more folksy style for this print. I then finished it off with some of those famous bear necessities lyrics in hand written modern calligraphy. Originally hand painted in watercolour, this is printed on 300gsm Tintoretto Gesso card which has a lovely thick and gently textured quality.